ST. LOUIS, MO.- The internationally renowned American painter Edward Eugene Boccia, died on September 3, 2012, in St. Louis, Missouri, at the age of 91. Boccia, a longtime Professor and Professor Emeritus of Washington University, St. Louis, was a favorite of the well-known American art collector, Morton D. Buster May. 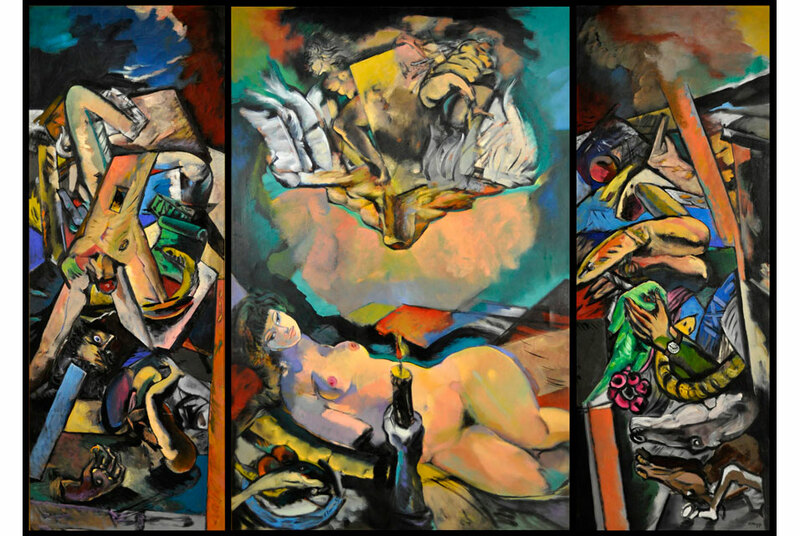 While Boccias early works were Abstract Expressionism, his mature style was figurative expressionism depicting Christian and mythical imagery. Boccia is best known for his triptychs many of which were thematically related to Catholic mysticism. Boccias work is found in over six hundred private collections as well as the St. Louis Art Museum, St. Louis University, University of Missouri St. Louis, Mildred Lane Kemper Art Museum of Washington University in St. Louis, the Denver Art Museum, the Nelson-Atkins Museum in Kansas City, the Museum of Art in Fort Lauderdale and the National Gallery in Athens, Greece. Boccia also carried out several major commissions for secular and religious institutions including the First National Bank, St. Louis Old Cathedral, the Catholic Student (Newman) Center at Washington University, and the Brith Shalom Kneseth Israel Synagogue, St. Louis. The power of his work earned him abundant honors, including a knighthood by the Cavaliere Al Merito Della Repubblica in Italy and the Borso di Studio from the Italian government. In 1990, Saint Louis University bestowed upon him membership in the Order of the Crown of King St. Louis IX. Boccia was born in Newark, New Jersey, in 1921. While still a high school student, he took classes at the Newark School of Fine and Industrial Arts. After graduating, the young artist attended the Art Students League of New York. He continued his art education by attending the renowned Pratt Institute in New York on scholarship, where he met Madeleine Wysong, his future wife. In 1942 he enlisted in the U.S. Army and served in the 103rd Engineer Combat Battalion. Boccia served in a camouflage division with other art school students whose primary duty was to fill fields with inflatable rubber artillery and tanks as a decoy for German planes. Boccia landed in Normandy one week after D-Day, then served in England, France, Germany and Luxembourg until the end of the war in 1945. During the war Boccia never stopped drawing and painting; he painted from cafes and foxholes using art supplies sent from home. He would roll up his completed artwork and send it back home. "He did these during sometimes intense fighting," said a retired teacher, Judith Mitchell-Miller, who owns several of Mr. Boccia's works. When he returned home in 1945, he married Madeleine, and earned his Bachelor's degree in 1948 and his Masters degree in 1952 on the GI bill from Columbia University. While completing his Master's degree, Mr. Boccia served as Dean of the Columbus Art School, Ohio where he also taught painting and drawing. He was recruited by Kenneth Hudson for the position of Assistant Dean at the School of Fine Arts, Washington University in St. Louis, in 1951. It was upon Boccias arrival in St. Louis that he met Buster May, the president of the May Department Stores Company. May was a prestigious art collector and would serve as one of Boccias most important patrons. May also introduced the artist to the artwork of Max Beckmann, the German Expressionist painter who, in the late 1940s, taught at Washington University in St. Louis. A fervent collector of Beckmanns work, May filled a carriage house with paintings by Beckmann; and from 1951 until his death in 1983, he also acquired an equally remarkable collection of Boccias artwork. Of Beckmanns work, Boccia told the St. Louis Post-Dispatch in 1996: "He became my God after I came here." Boccia in fact was the proud owner of Beckmanns easel. Each spring, Buster May visited Mr. Boccia's studio in Webster Groves, Missouri. "He wanted to see everything, and I have always been very prolific," said Mr. Boccia in an interview with the St. Louis Post-Dispatch in 1985. "One year, he would buy drawings like he was buying Hershey bars  the next year, a stack of paintings." May purchased hundreds of paintings and drawings, and hauled them back to his residence in Clayton by truck. He continued to purchase yearly until his death in 1983. What he did not keep, he gifted to colleagues, friends, museums, and universities. By the mid-1980s, Boccia added poetry to his artistic repertoire using the same vivid exuberance of his painted canvases. As long as this man breathes the planets air, he cannot stop painting, wrote Missouris 2010 poet laureate, David Clewell. Nor can he stop the pursuit of another of his passions: making poems. There are several publications of his illustrated books of poetry, including Held Up by a Dream and Moving the Still Life. His poems have earned national and international awards. Toward the end of his life he wrote a trilogy of poems titled The Death Series: A Visit from Raphael. A Memorial Service was held in front of his mural, Path of Redemption (1964), in the Washington University Catholic Student Center chapel in St. Louis on September 9, 2012. Mr. Boccia is survived by his wife, Madeleine, of 67 years, his daughter, Alice Boccia, and granddaughter, Jennifer Pateraki. Memorial contributions in memory of Mr. Boccia may be sent to Petruta Lipan, Director, Saint Louis University Museums and Galleries, Saint Louis University, 221 North Grand Blvd., St. Louis, MO 63103, for the development of St. Louis University Museum of Arts collection or to the Washington University Catholic Student Center, 6352 Forsyth Blvd., Clayton, MO 63105. An exhibition of edward boccias paintings, including several triptychs and polyptychs, will be held at the St. Louis University Museum of Art, from February 22 until April 21, 2013. A Catalogue Raisonné of Mr. Boccias artwork is being developed. Scholarly contributions and information regarding the location of Boccias artwork are requested for inclusion in the catalog. Entries may be submitted to the website edwardboccia.com.